I have to admit, I have Olympic fever... Its a strange sort of sickness, whereby I celebrate with each Canadian athlete, as though I knew them personally. I also am known to cry through the special segments talking about the athletes' journeys, and of course when they receive their medals. I profess I cried quite a bit during the opening ceremonies. And when I'm not shedding my happy tears, I'm speaking with a constricted throat as I try not to cry. I didn't think I'd be so emotionally invested... although I certainly have a right to be seeing as my taxes helped pay for a lot of it! 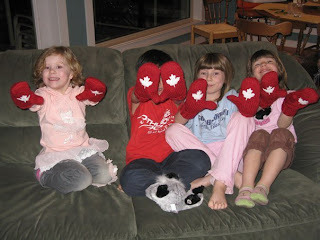 We each have some Olympic swag now, mittens and t-shirts, and wear them with pride! Actually, with a lot of pride! I am so thrilled with the amount of national pride that I'm seeing Canadians display this season. As a nation often criticized for our lack of national pride, (I mean, we are fairly overshadowed in that department by our neighbours to the south) I am delighted to discover that its chic to wear Canada emblazoned across our chests, and maple leafs seem to be more popular as mascots than the strange creatures they created for the games! One of my most favorite parts of the opening ceremonies was the poet with his tribute to our wonderful country. Brilliant. Aria's class celebrated the Olympics today at preschool. They all participated in three races: speed-skating, bobsled and the torch relay. It was very fun to watch. We even had a lighting of the Olympic cauldron and medal ceremony. The kids have been practicing for weeks, and it was fun to see them learning team-play and cheering each other on. I thought I was the only one who cried through the Olympics! Glad to know there are others out there too!! !